The Pregnant Husband: 9w4d: My Incomplete Pregnant Brain While Baby's Heart is Completely Developed! 9w4d: My Incomplete Pregnant Brain While Baby's Heart is Completely Developed! I am seriously suffering from a case of "pregnant brain." It is definitely not a joke. It is a condition where all one thinks about is the pregnancy. I guess it must run in the family as Dad had it too. As I was talking to Mom yesterday during wife's maternity fitting, she was asking me if I have been having any of the usual wife symptoms. Hello! That is the title of this blog. But realizing Mom has to hit the google "translate" button, I am sure the translation was off. So it happens that Dad used to get the same symptoms I am having during the pregnancy. Who knew! My dad used to get nausea. I don't since the wife doesn't. But the fatigue and drowsiness no doubt. How can that be? weird. The focus for the growth of the baby right now is the development of its head, muscles in trunk and limbs. The development of our baby's heart is officially complete today! Today we wrap up day 67 of our pregnancy. Oh yeah! Keep 'em coming. The wife was giddy as she was sporting her maternity pants today for the first time. I think she was secretly hoping someone would notice and call her out. That or they think that her love of food has been taken to a new level. It was a cold and raining day today so I decided to surprise the wife with one of her favorite dishes: shrimp cocktail. My apologies but the recipe is a passed-down-by-generations and highly guarded recipe. It's incredible. Wife lost yet another pound today though. And her bladder seems to be decreasing by the day as her frequent bathroom breaks keep increasing. On the emotional roller coaster - she had another crying bout at school today. They incorporate Channel One into the classroom (an educational-based TV program) and while watching one of the stories about football players, she couldn't hold them tears in. It was a touching story about a special ed kid who was on the football team and the players embraced him and motivated him to succeed. This is a big deal because the wife DOES NOT easily cry. So our little raspberry is now the size of a grape. 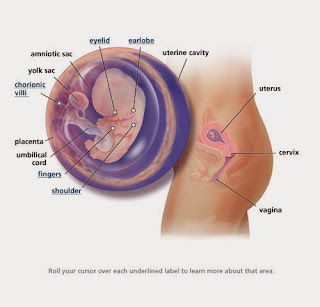 The placenta is now developed enough to the point that is is now producing a lot of the needed hormones. It now has little earlobes which are awkwardly located by what is our jaw (they will eventually move up). The fingers are enlarged as they are still developing. The eyelids are now fused shut and won't open until week 27. The baby can now move all her limbs, including her shoulders! The miracle of life before our eyes. And best yet, all happening in the womb of the one I most love.